The mixed use platform states that the zoning code should regulate specific harms like pollution, noise, lighting, and shade, but not living arrangements, commercial activity, or other characteristics that are not specific harms. In each zone, a mixture of uses will be permitted. The plan below is one example of how mixed use zoning could work. It protects residents from genuine harms without separating businesses from residences or unnecessarily restricting the supply of housing. The plan can also be downloaded as a PDF. 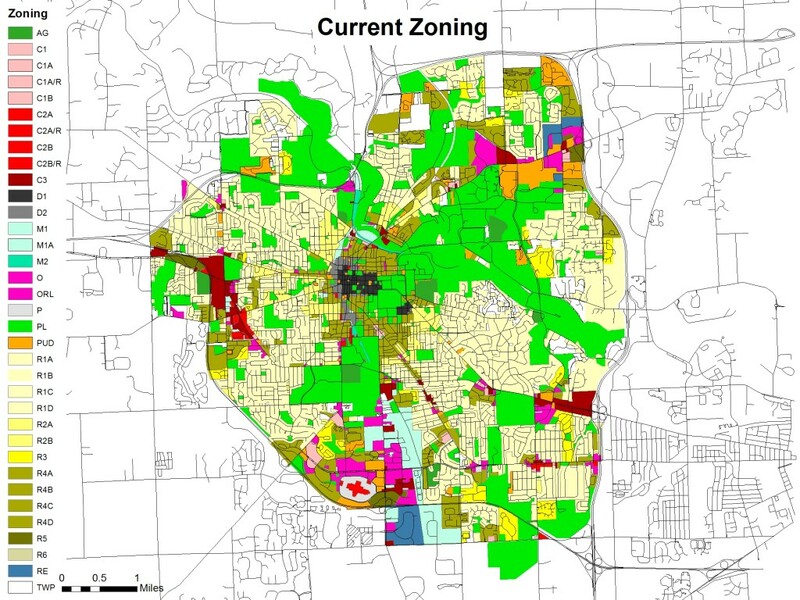 This zoning plan is designed to prevent people from using land in a way that harms others. Land uses that endanger other people are forbidden. However, some popular land uses cause harms that are not dangers, but annoyances, like noise and shade. Many are willing to live near these harms as long as they are also free to create them. A convenient way to accommodate residents with different wants is to create a variety of zones that allow different degrees of harm. Because the zones share borders, people in less restrictive zones are prohibited from irritating people in more restrictive zones. The zones are arranged so that no one has to change their current uses of land. The Mixed Use Zone covers noisy, shady areas that currently have tall buildings or stores open late. 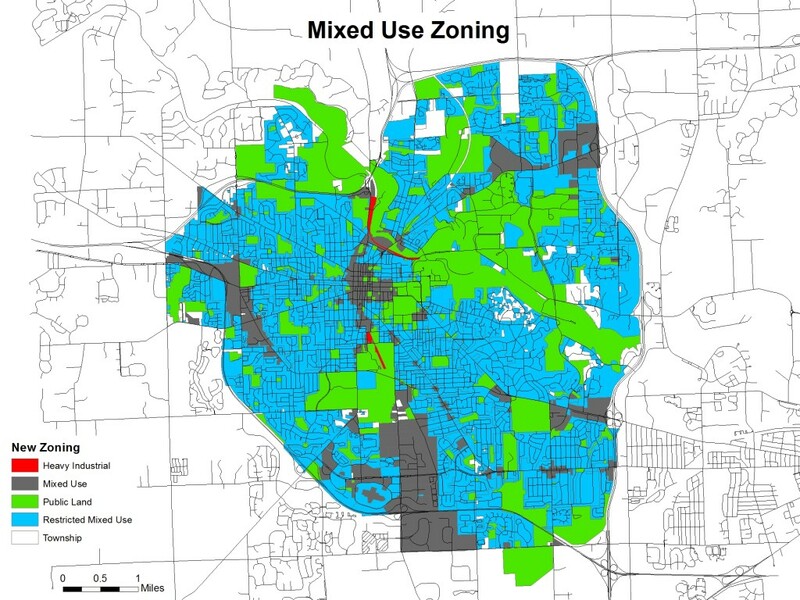 The Restricted Mixed Use Zone covers areas that do not have these uses. The Heavy Industrial zone covers existing areas of heavy industry. Owners may change the zoning of their properties from Restricted Mixed Use to Mixed Use at any time. They may also change the zoning of their properties from Mixed Use to Restricted Mixed Use, so long as the change would not force another owner to stop an existing land use. The Heavy Industrial zone may not be expanded. 1. No use may produce heat or dust discernible at the property lines. 2. All hazardous materials, waste, and wastewater associated with the use shall be handled and disposed of in a manner that is not dangerous to the health and safety of those nearby. 3. Truck deliveries that produce noises louder than 60 dB(A) onto properties zoned Restricted Mixed Use are forbidden from 10:00 PM to 9:00 AM, even if the vehicles themselves are exempted from noise regulation. 4. No use may emit air pollution that is detrimental to the public welfare. 5. All lighting devices shall be shielded so that so that the amount of light projected onto a property zoned as Restricted Mixed Use does not exceed 1/10 of a foot candle. 6. No use may produce foul odors discernible at the property lines. An odor is foul if a sample of people finds it objectionable in usual places of occupancy, or if the odor can be detected when the volume of odorous air is diluted with five volumes of odor-free air for two separate trials not less than fifteen minutes apart within the period of one hour. 1. Structures must be set back three feet from properties zoned Restricted Mixed Use. On corner lots, structures must not block a driver’s view of a road intersection. 2. The maximum height for all structures is thirty-five feet. 2. The maximum height for a structure is either thirty-five feet, or one-half the distance between the structure and the closest property zoned Restricted Mixed Use. The greater value is the maximum height. If there are polluting or dangerous uses in the existing Heavy Industrial Zone when this zoning plan is made law, no additional harmful uses may be created. If no polluting or dangerous uses exist, areas in the Heavy Industrial Zone will be rezoned as Mixed Use.